This Cedarwood project completed by Nicolas Tye architects showcases a contemporary rural residence built with the utmost consideration for quality and convenience. 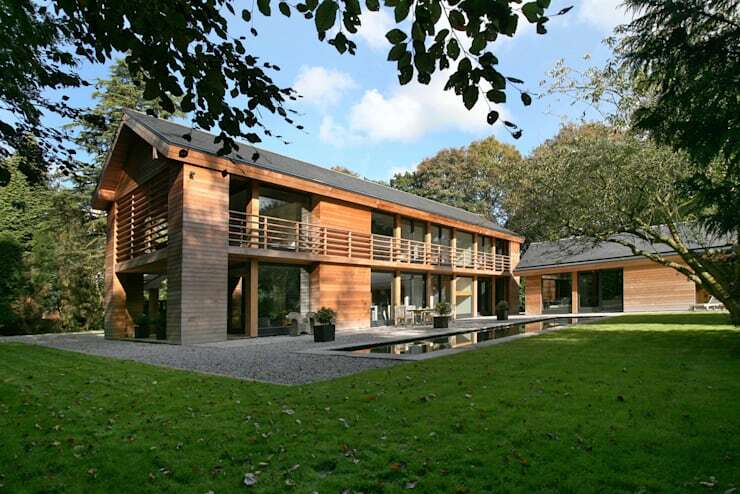 The structure is nestled in the mature forest of the Cheshire countryside and is designed to reflect its wooded surroundings with a timeless and elegant design. Reminiscent of a log cabin, this series of refined cedar buildings blend seamlessly with their surroundings, creating a living space that feels established and connected to its natural landscape. The buildings have been strategically positioned to provide an array of landscaped courtyards, each of which offers its own distinct character. 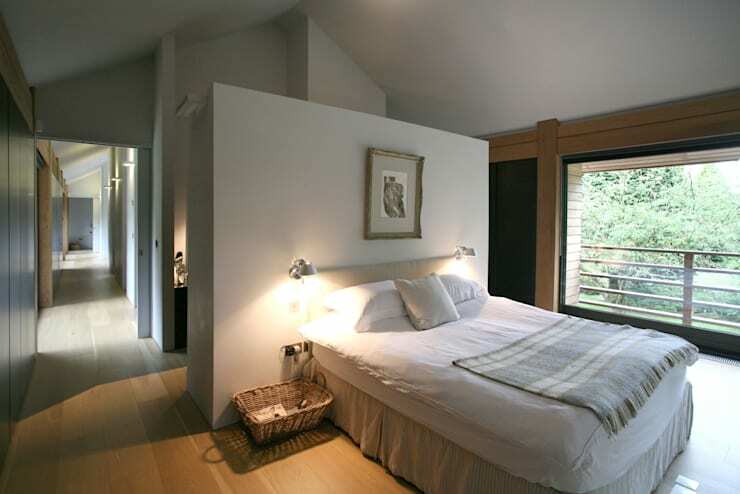 Both inside and out, the buildings have been constructed from the highest quality natural materials – this woodland home provides a healthy and sustainable living environment that's well-insulated and filled with warm wooden tones and streams of natural light. The most eye-catching aspect of this woodland home is the wide expanse of red cedar that stretches before your eyes! Long horizontal lines dominate this scene as the home takes advantage of its ample square footage. Breaks in the cedar have been made to accommodate large panels of recessed glazing that provide panoramic views across the lawn while also creating exceptionally well-lit internal living spaces. 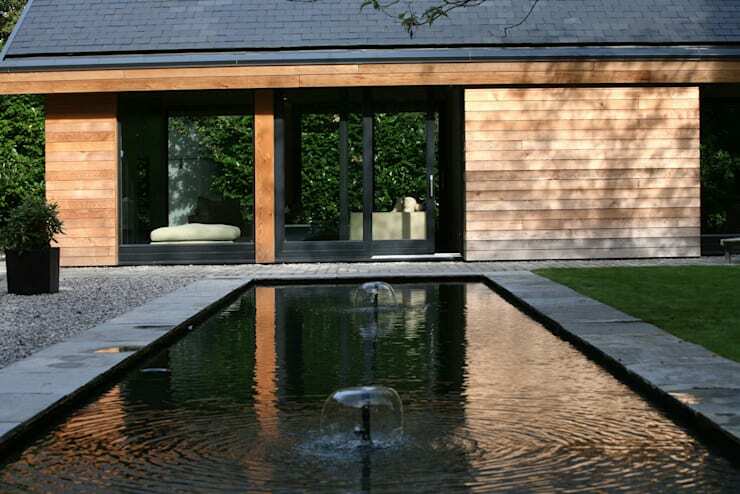 More than a simple window pane, these glazed panels are incredibly thermally efficient, allowing energy and warmth from the sun to enter the building and provide a passive heating system for the cold winters. These two structures are somewhat reminiscent of a forest chalet – you'd almost expect to find a smoking chimney sticking out from the top of the roof! The natural slate roof lines that top off these two structures provide shelter and protection from the elements, the closer of the two buildings providing an open-air garage that can shelter several cars under its roof. The pure, simple form of the roofs is further enhanced by the use of recessed guttering and concealed down-pipes, creating a seamless and distraction-free design that alludes to simpler times. The structure of the walls is found in a rigid steel frame clad in Western Red Cedar. This vibrant red wood has a superior natural durability and is highly resistant to moisture, decay and insect damage. Within, a layer of sustainable wood-fibre board serves as thermal insulation, reducing heat loss in the winter and preventing overheating during the hot summer months. That said, the cedar chosen for this building was a top-quality choice that is sure to retain its luster and colour for decades to come. 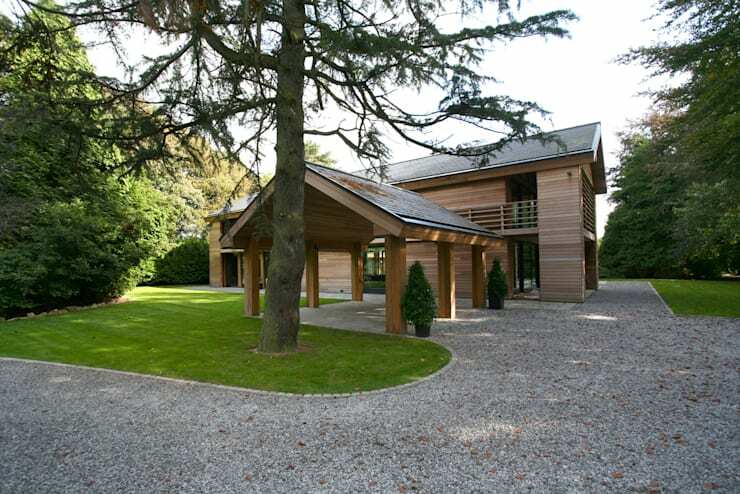 In addition to being a high-quality and durable material, the use of cedar is a natural choice, as it creates a strong visual tie that anchors the building to its forested landscape. For another look at a lovely wooden home, check out this old-fashioned log cabin! There's no better light for working or studying than natural sunlight. 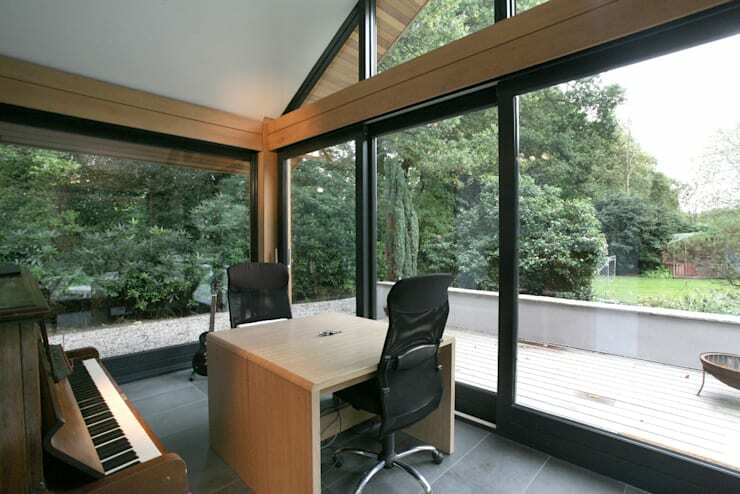 Here, a simple a-frame interior offers a bold black outline for the large windows that permit plenty of light to enter the home office. Surrounded by ample thinking space that's created in the high ceilings and transparent walls, this home office is a peaceful and relaxing spot for a stress-free workday – talk about a healthy living environment! The interior of the home makes little use of interior walls, keeping much of the space open in a spacious, airy layout. This upstairs bedroom follows this pattern: the surrounding glass walls may keep out sound, but they certainly aren't keeping out any light. 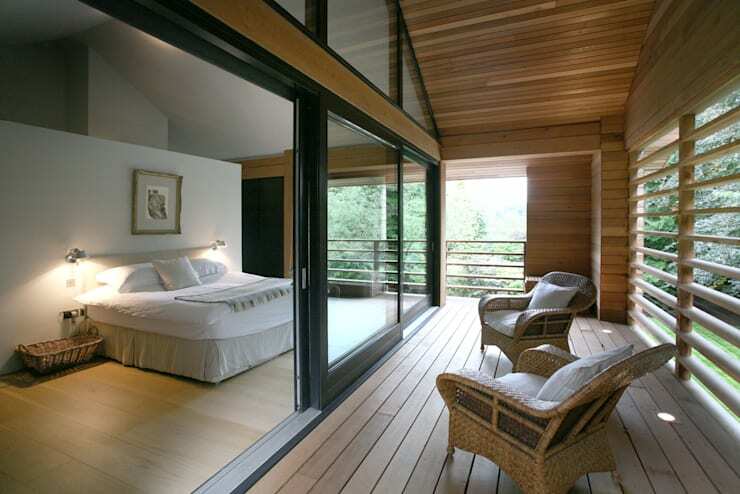 A balcony just beyond the bedroom allows sunlight to stream across the warm wooden floor, in a space that could easily be a Swedish sauna with all of its toasty, warm wooden tones. If you're searching for more cottage and cabin-inspired homes, have a look at this warm and friendly cottage which would be perfect in Canada. This bedroom has its own sense of separate space, but the bedroom wall that displays a single painting is not much of a wall at all! This wall acts as more of a partition than a wall, allowing you to breeze easily from the sleeping space to the dressing room and bathroom beyond. If there ever was a way to create a feeling of spaciousness in a bedroom, it is through the clever elimination of a floor-to-ceiling wall. 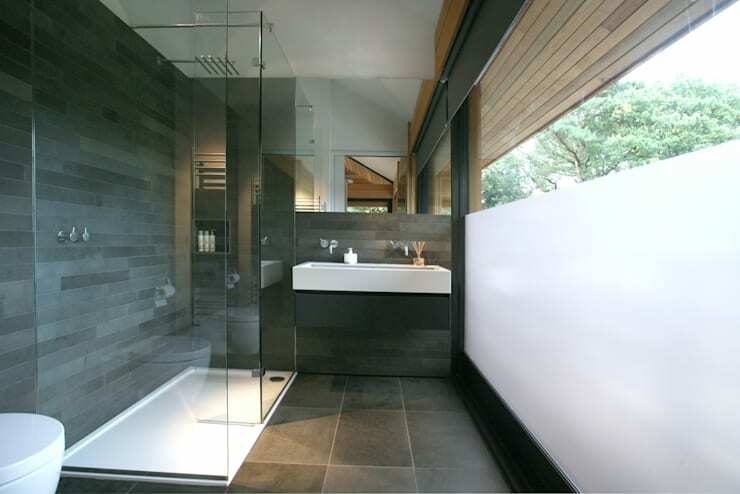 Here's a great example of a bathroom that enjoys a sense of transparency and spaciousness without infringing on privacy. the window is transparent from the chest up, and translucent from the chest down, a perfect solution for a space that needs both light and a comforting sense of privacy. With such dark tones in the stony grey floor and walls, this expansive window is a necessary feature for brightening up the space and bringing balance to the dark tones. A larger-than-average mirror and a transparent standing shower work to open up the room, allowing light to reflect and rebound in every corner of the space. This kitchen and dining room follow the open-concept layout of this home, but they take the simple and pure themes a step further, manifesting in a highly stylish minimalist space. 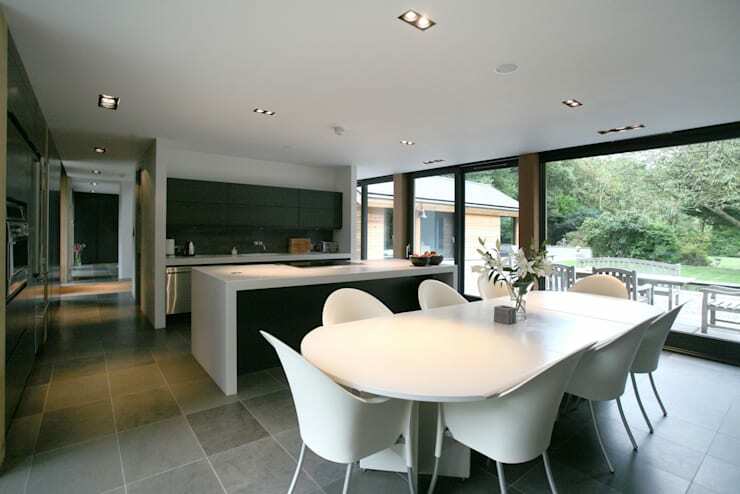 Smooth lines and a pure white colour make a simple statement in the dining area, while a white and black kitchen beyond makes a minimalist play on a classic colour scheme. This space says cleanliness and simplicity , offering a smooth blank canvas for the lively dinner conversation that's sure to fill the space. 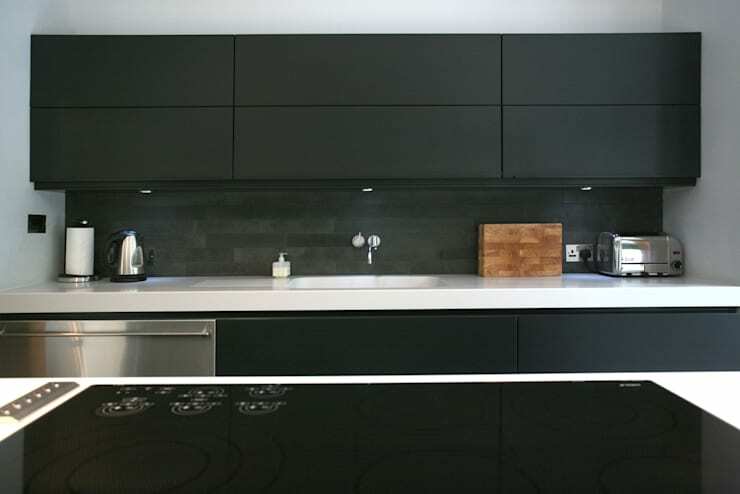 A closer look at the impeccably smooth kitchen emphasizes how every surface of this space is streamlined and distraction-free, from the handle-free cabinets to the simple faucet to the glossy black countertop of the kitchen island. There's no doubt that a kitchen like this is an easy place to keep clean, as it offers an ordered, no-frills approach that's easy to wipe in one clean sweep. This bold black-and-white kitchen isn't exactly what you'd expect to find inside of this cedar cabin, but it certainly is a welcoming and stylish surprise! Loving the warm tones of this country home? Share your comments below!